Think outside the box! 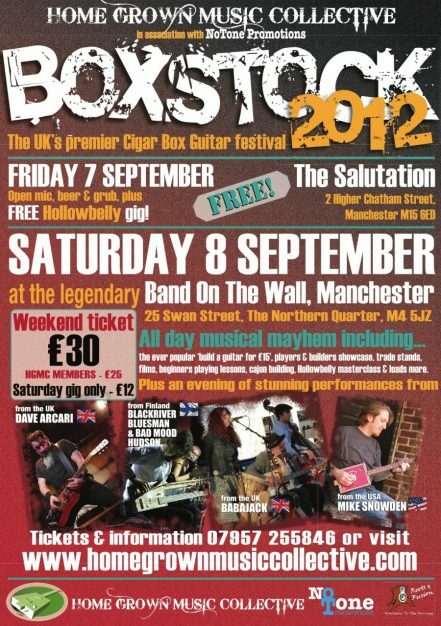 Boxstock 2012, the cigar box guitar festival, is a day-long extravaganza of making workshops, instrumental tuition, film and live performances from some of the world’s leading performers in this home grown-music scene that features these live performances on these incredible intruments. You can even make your own guitar and cajon to take home on the day! This is music stripped back to the bare bones, raw and full of soul, using the simplest of home-made instruments, music with fire and passion. Performers on Saturday night (as part of Band on the Wall’s Beer n Blues Festival which also features rare beers all night!) include Dave Acari from the UK, Blackriver Bluesman and Bad Mood Hudson from Finland, and all the away from USA for his first time in the UK – Mike Snowden. Mike Snowden knows how to work a live show. He’s had a lot of experience. He started out playing bass some twenty years back, touring the US and Canada, and opening for legends such as The Indigo Girls, Joe Cocker, Big Head Todd and the Monsters, the Dave Matthews Band, and many more. After touring with ‘Band De Soleil’ for almost 6 years straight (with an average of 250 gigs per year), it was time for a break…. during which he stumbled upon a guy playing a cigar box guitar. He was hooked, and immediately embarked on this new direction. Mike quickly emerged as one of the scenes most influencial writers and performers, and has released 3 cds of original material, including his latest ‘Cigar Box Stomp’, mixed by legendary sound engineer Tom Tapley (Pearl Jam, Bruce Springsteen). Dave Arcari is perhaps more well known to a lot of regular blues afficiandos, but his left of field approach is right in the home-grown music zone. Dave Arcari’s alt.blues sounds owe as much to trash country, punk and rockabilly as they do pre-war Delta blues and have been showcased via seven internationally-acclaimed solo CD releases. With more than 100 UK dates a year plus regular shows in Finland, Estonia, France, Germany, Belgium, Poland and Canada, Arcari is one of the hardest gigging live artists on the circuit. Jukka ‘Black River Bluesman’ Juhola & Andy ‘Bad Mood’ Hudson play their blues in the deep woods and frozen swamps of the muddy Black River Delta, way up North in cold Finland. Their unrefined, electric blues have been compared to the rough sounds of the Mississippi Hill Country artists as well as to anything between Deltahead and Black Keys, or psychoblues and garage. Finland’s alternative blues hero Jukka has literally played all over the world: from Brazil to Nepal, from Thailand to Russia. He’s travelled the American South and jammed with the late great Mr. Tater The Music Maker. Expect a masterful set tonight. On hand during the day is The Godfather himself, ChickenboneJohn who will be leading players’ workshops. After touring Italy, Germany, Netherlands and Belgium, Hollowbelly is back in the UK to show you good people the secrets behind his style and his sound, with his popular “Learn to Play The Hollowbelly Way” with the UK’s premier punk blues perfomer. And making a welcome return is the “Make a Guitar for £15” workshop…yes for just a few quid you can make your own 3 string electric guitar and take it home with you…last year’s session was a rip-roaring success…so reserve a place early to avoid disappointment!! Also, a new feature of Boxstock 2012, build your own cajon and learn the playing rudiments. Plus during the day there will be trade stands with guitars, amps and parts and much more for sale, with the opportunity to talk to the builders and get some advice and tips straight from the source. Whether you are familiar with the scene or only know about the scene through people such as Seasick Steve and Jack White, a great time and a warm welcome is assured– come along and be part of this home-grown music revolution!